In many ways, the Daytime Emmys acknowledged the end of an era, with longtime soaps going the way of the buffalo and many long-standing personalities stepping down. It was a big year for the Daytime Emmys, as they said farewell to two stalwarts of daytime television—Oprah and Regis Philbin, as well as the impending departure of two long-running soaps. In a tribute to Oprah, Gladys Knight warbled "That's What Friends Are For" as a montage of the talk queen's shows played behind her. Oz paid tribute, as did frequent Oprah guest Celine Dion, who sang "Because You Loved Me" from the stage at Caesar's Palace, where she performs. Winfrey appeared on tape with her staff gathered behind her and holding the Crystal Pillar award she was given for changing the face of daytime television. Philbin is leaving his syndicated chat fest later this year, and he and co-host Kelly Ripa shared talk-show host honors with Dr. Oz. Philbin and Ripa didn't attend. Meredith Vieira ended her five-year run on the "Today" show earlier this month, and she was nominated for best game-show host for "Who Wants to Be a Millionaire." The awards show was in its second year in Las Vegas, where it moved from Los Angeles after up-and-down ratings. "The Bold and the Beautiful" won drama series honors for the third consecutive year. Executive producer Bradley Bell accepted the trophy, saying, "It's over the top. We're so grateful." Bell saluted his late father William. who created "The Young and the Restless" and gave the younger Bell his start in the business. "Dad, we did it," he said. "Happy Father's Day." Laura Wright, who plays Carly Corinthos on "General Hospital," won her first Emmy in her first nomination. She joins Finola Hughes in 1991 as the only stars of the ABC soap to win lead actress honors. "This has been 20 years of the best career ever," Wright said. Michael Park, who plays Jack Snyder on CBS' "As the World Turns," earned lead actor honors. Scott Clifton won younger actor honors for his role as Liam Cooper on "The Bold and the Beautiful," one of four trophies the show earned. It tied with "The Young and the Restless" for directing in a drama series. "The Young and the Restless" won for best writing. Brittany Allen of "All My Children" earned the show's final Daytime Emmy, winning for younger actress in a drama series. She is no longer playing the role of Marisa Chandler. The ABC soap opera, along with the network's "One Life to Live," are leaving the air after more than 40 years because of declining ratings. "My heart breaks for all these people that this is not going to be a part of their lives," she said backstage about the show's impending demise. "Having just gone through something like this, I survived. It was scary, but change is a good thing and it opens the door for new opportunities." Jonathan Jackson of "General Hospital" and Heather Tom of "The Bold and the Beautiful" won as supporting actor and actress in the live show hosted by Wayne Brady at the Las Vegas Hilton. Jackson, who plays Lucky Spencer, brought his young son and daughter onstage with him. "It's Father's Day. I couldn't resist," he said. Tom, a veteran soap actress who plays Katie Logan Spencer the CBS show, won for the first time after five nominations in the supporting category. "I have to thank the daytime community as a whole," she said. "You have been my home for most of my life and I am so grateful for that." "Jeopardy!" and "Wheel of Fortune" tied for best game show, fitting since the respective hosts, Alex Trebek and Pat Sajak, received lifetime achievement awards during the show. Those shows dethroned "Cash Cab," which had won three straight years. "We're part of Americana," Trebek said backstage with Sajak alongside him. "People, when they hear the themes to 'Wheel' and 'Jeopardy!' they know immediately what the reference is. Part of that is because we've been on for so long. We hope it will continue for as long as we want to do it." Trebek has quizzed brainy contestants for 27 years, while Sajak has been selling vowels for 30 years. Ben Bailey of "Cash Cab" took home a trophy, repeating as best game-show host. He didn't immediately appear to accept his award, leaving presenter Tracey E. Bregman to ask the audience, "Anybody?" A harried Bailey walked out from backstage, where he said he had been using the restroom when he heard his name called. Backstage, Bailey admitted he hadn't washed his hands but promised to do so, which surely would have met the approval of Dr. Mehmet Oz. Oz repeated as best talk-show host, while his "The Dr. Oz Show" won for best talk show-informative. Oz, one of Winfrey's proteges, is being rewarded in many markets with the 4 p.m. slot that Winfrey ruled for so many years. "I don't feel pressure," he said backstage. "I feel honored and I feel responsibility to give to the audience what she did so beautifully for 25 years." 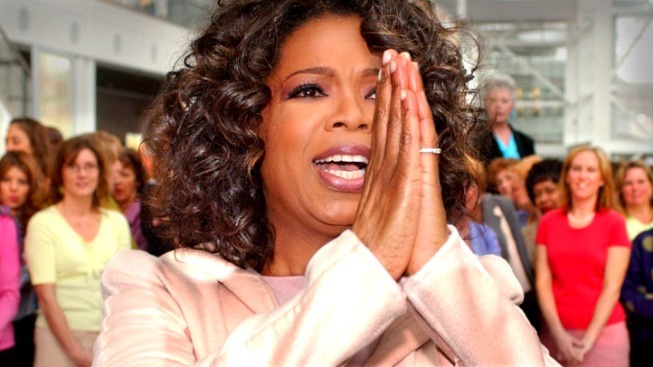 Oz added, "I think I'll have Oprah on as a guest sooner rather than later." "The Ellen DeGeneres Show" earned best talk show-entertainment honors for the second straight year, although she skipped the ceremony, yielding the spotlight to her producing and writing staffs.